Included on that list of old racers tuning tricks is spark plug side gapping. 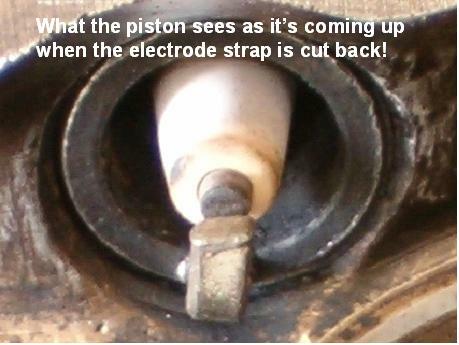 What’s being discussed here is not a true side gapped spark plug but a gapping procedure or electrode modification that allows the spark to actually fire off of the very edge or ‘side’ of the spark plug’s ground electrode. 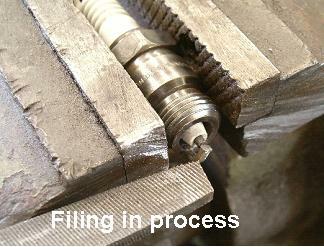 In lieu of a better description, this gapping process will simply continue to be called ‘side gapping’. Side gapping is performed even though the end result may not be measurable but a logical thought process will maintain that doing this will not be detrimental to efficiency or performance and in fact, should help it. Like spark plug indexing, spark plug side gapping will vary in its benefit depending upon the application to which it is being applied. While this procedure tends to be very effective on two stroke engines, the benefit on four stroke engines is less predictable depending in part to the combustion chamber design and air flow characteristics of the engine in question. On both the two and four stroke engines, the immediate benefit is typically observed in engine starting where it’s quicker or with much less starter effort. The general premise behind side gapping lies in getting the spark to fire directly on the end of the grounding electrode instead of having the spark shrouded by the electrode strap. Doing this is typically done in conjunction with spark plug indexing in order to get as much exposure of the spark to the compressed fuel mixture as possible. 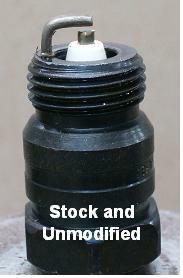 A typical out of the box spark plug will have the ground electrode (strap) completely covering the center post consequently shrouding or covering it to some degree. Side gapping will simply modify this strap so the end of it is exactly in line with the centerline of the spark plug thereby putting the spark in a position to fire directly on the end of the ground electrode which in turn permits the spark to be better exposed for igniting the fuel mixture. A variety of methods can be employed to shorten or remove the excess amount of ground electrode strap so that the new end is centered directly over the center electrode. 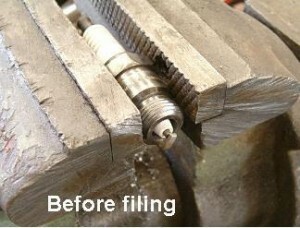 A grinder or file are equally effective but in either case, care must be taken to insure that the center electrode (tip) or other portions of the spark plug are not unduly damaged or altered in the process of working on the ground strap. After the strap is appropriately modified, it will need to be deburred and then the gap reset to the desired specification. 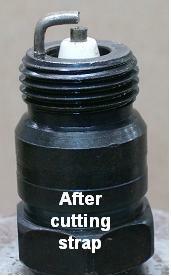 It’s important to note that the bottom edge of the electrode where it has been shortened does need to keep a sharp edge and not be rounded in order to promote a more decisive and consistent length spark. Spark plug side gapping is just one more tuning aid that when used with the myriad of other seemingly unimportant tuning tools accumulatively adds to a measurable increase in power output that by itself would not be significant. More simply said… “every little bit helps”.